ASL teamed up with the National Association of Music Merchants (NAMM) for the second consecutive year to celebrate the creation of music. We documented Make Music Day, the annual celebration connecting musicians and music lovers. Make Music Day consists of free public events spanning various locations and activities in New York City. With multiple overlapping events, ASL decided to cover the day with two, 3-person crews consisting of a Canon C300 videographer, a production assistant and an audio operator at each event. 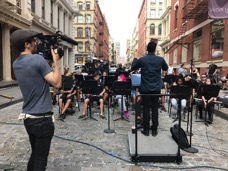 Our first crew traveled to Greene Street in the heart of Soho for the “Concertos for Buildings” event. The event featured performances by professionals and students from Mantra Youth Percussion and the Rahway, NJ High School Wind Ensemble of five newly commissioned compositions, as well as some reimagined pieces. Percussionists used the area’s historic buildings as resonant instruments setting a modern, experimental tone to the music. We made sure to take the camera off the tripod and visually tell the story from a number of creative angles. We really wanted to capture the feel that there was an orchestra playing their hearts out in the middle of what is typically a crowded New York street. ASL’s second video crew traveled to the World Trade Center Memorial, where four grand pianos were placed in each corner of the plaza. Musicians of all ages shared their compositions with the world through a wide variety of genres and styles of music. Since the pianos were spread so far apart, we put our operator on a Ronin gimbal so he could move quickly and efficiently from point to point. We managed to capture beautiful curved dolly-esque moves wrapping around the performers and creatively captured the pianists’ reflection through the instruments. It was powerful seeing people come together through this shared event, spreading messages of peace and love, and it evoked special meaning by taking place at the World Trade Center Memorial. Next, ASL brought the video teams together team at Battery Park for the “MP3 Experiment,” in which participants downloaded a smart phone app and listen to synchronized secret instructions in a public setting. Participants carried out coordinated, outlandish tasks, which resulted in bizarre situations, especially for park-goers and other spectators. 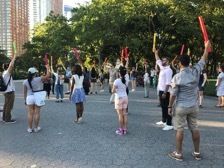 This year saw the debut of a new musical composition performed by hundreds of participants using Boomwhackers; lightweight color-coded percussion tubes tuned to musical pitches by length. The highlight for ASL was when the voice in the headphones instructed the participants to give someone not wearing a headphone a dollar and ASL quickly collected $10, which was used to by waters for the hard working crew. People in a large urban center like New York City often avoid connecting with other folks that they come across in their communities. However, events such as Make Music Day remind us of our universal relationship to music and the importance of bonding with our fellow neighbors. At ASL, working on projects that promote the arts and the deepening of community ties fuels our passion for creating powerful and meaningful content. Witnessing the strong collaboration of diverse crowds during Make Music Day truly reinforced the power of music and how the medium brings people together. Check out highlights of ASL’s 2016 coverage of Make Music Day here and stay tuned for the 2017 video here.